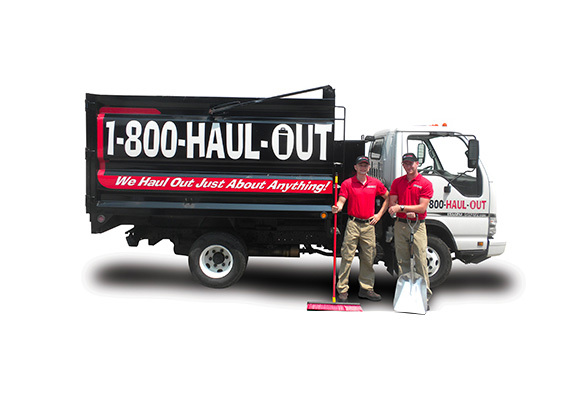 A full service haul-out and junk removal company. We do all the work, start to finish, for every one of our valued customers. We Haul Out Just About Anything! Full Service Junk Removal - We Haul Out Just About Anything! 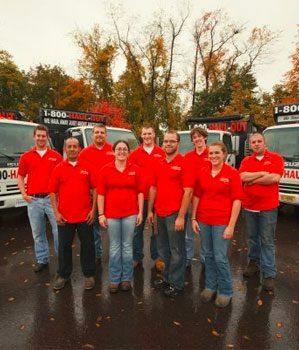 Our professional and courteous team of Haul Out Heroes will gladly do whatever it takes to provide you with the best customer service imaginable! We will get the job done quickly and professionally. 1-800- HAUL-OUT determines our prices based on the WEIGHT and VOLUME of the materials that is loaded into our 16 cubic yard dump truck. Upon physically seeing the items, our team of professionals will determine the volume by approximating how much space the items will take up in our truck. The weight of the items will also affect the price (a full truck of gravel will cost more than a full truck of cardboard). We ALWAYS confirm a price with you before we begin work, and NEVER consider a job complete until you are 100% satisfied with our completed work. What types of junk can you NOT remove? Hazard waste, chemicals, gasoline, propane cylinders and certain types of paints cannot be removed by our truck teams, however, most times we can help you dispose of these items by other means. What types of junk can you remove? We can remove just about anything you'd find around a home or office, from unwanted items, appliances, construction and yard debris and old furniture. We even demolish swing sets and sheds and can remove pianos. As often as possible 1-800-HAUL-OUT will donate or recycle debris, however, recyclable or donated items vary greatly depending on different markets. Approximately 70% of the debris we remove is donated or recycled. We accept cash, check or credit card as payment for your satisfaction of the completed work.